This month, Pam and Lynn talk about New Year’s resolutions, paper piecing, and why you should enter quilts in shows. 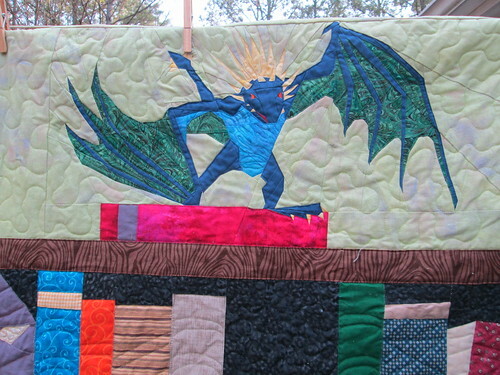 Close-up of the dragon on top of the bookshelf; see more detailed pictures of the bookshelf quilt on Pam’s website. Episode 232 of Hip to be a Square is the podcast in which Pam went over the judges’ feedback on her quilts in the East Cobb Quilters’ Show. Lyric Kinard’s list of quilt show and deadlines. New this month! Audio only versions of the show are available in the Hip to be a Square podcast feed. Our next Virtual Stitch-In is February 12, 2016! The amount of entries and the slots they have to hang quilts has a big thing to do with acceptance into a juried quilt show. I just read on MQG blog that they had less then 400 spaces to hang quilt but have over 2000 entries…. that means a lot of quilts were rejected….. If you do not succeed the first time then you need to try again. I really enjoyed the show! I listened via podcast and found that I enjoyed it just as much in that format….except the sponsor tips 🙂 Oh well! I’ll just have to imagine those tips. One kindly asked for request (not a bitchy complaint), could you try not to disregard or put down traditional quilts? Some of your audience, I, for one, love traditional quilts and think Grandmother’s Flower Gardens are gorgeous. I also love some modern quilts, like Pam’s Harry Potter quilt. I don’t want the quilting community further divided by the traditional vs. modern preference. I also have to comment that I was literally laughing out loud while Lynn was talking about her New Year’s Resolutions and her method of choosing them. I’m giving up over-exercising this year! Re: Paper piecing: Agree with everything you said about the accuracy (yay!) and tedium (ugh!) of paper-piecing. Trying now to do “freezer paper piecing” (check out this tutorial: http://www.twiddletails.com/images/FPFtute/FPFTute.pdf). This method reduces the number of templates you need to print out (they can be used multiple times) eliminates working backwards and removing little bits of paper and provides an easy way to determine how big a piece you need for the spot you’re adding (the folded back area will show you what you need). I’m still working (well need to work) on blocks for a Halloween quilt I’m doing that way but for what I’ve done to date, it worked for me. And yes to the spreadsheet but (sheepishly) haven’t updated it in a while…..